During a mobility lesson I directed a student, Claire, to walk to her favorite convenience store. She had been given a few dollars and was going to spend it on what many kids decide – candy! Claire did a great job and arrived quickly at the store. After directing her to the candy aisle, Claire began examining all of the choices. She did not want me to identify them so I asked her how she knew the difference between the candy she touched. I can tell the difference between a KitKat and a Hershey Bar but did not think the chocolate bars would be identifiable. Claire showed me how she places her fingers on the top of the bars and she could textually tell the difference between the bars. 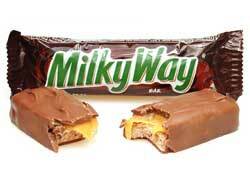 She showed me a Snickers, Milky Way, and Three Musketeers…they all have different patterns of chocolate on the top. I was thrilled to see someone had allowed Claire the time to feel the candy in a candy aisle long enough for her to learn the identity of candy just by touch. Well, either that or she really gets a lot of chocolate!